Butcher & Larder is one of those places that opens and its seems like it's always been there. Certainly, Rob & Allie Levitt's presence in the community of those who care about what they eat and how it got there has been felt for so much longer (about 8 years now I think) than the 15 months or so that the shop has been open. Actually, as much as this nomination is for the shop, it is also for Rob and his team as the true Great Neighborhood Resources--for their knowledge and ability to share that knowledge with anyone willing to stop in and inquire. I enjoyed Mado but wasn't part of the "in" crowd there, nor would I say that I'm more than just an appreciative patron of their store now. I've probably most enjoyed the learning process of being a customer there--from the sausage making class to their patient explanations and suggestions about how to use their products--they care about what we know, though never in an overbearing manner. And the product--delicious, unique, beautiful. Not everything I've bought was a favorite but the exploration has been very satisfying. Thread is here: http://www.lthforum.com/bb/viewtopic.php?f=16&t=30775 and numerous other mentions, mostly in regards to going to see Rob to ask him what to do with various "parts" that people have picked up along the way--if that isn't a community resource, I don't know what is! Last edited by boudreaulicious on March 15th, 2012, 12:11 pm, edited 1 time in total. Is this one of Ronnie S's no brainers? A very obvious yes for me. My only complaint is that I wish it was a lot closer to Oak Park. My biggest likes, they'll always find me a very good cut in the range I want to pay that day and they always set up the meat right for me, especially tying up roasts. I'd like to also add, that in the vein of what makes some places more great or more neighborhood-y, Butcher & Larder, when asked, has been a quick supporter to other causes and non-profits. Vital Information wrote: Is this one of Ronnie S's no brainers? Yes, this the one of three places I was sure would be nominated and needless to say, I fully endorse the nomination. The vegetarian peanut gallery heartily endorses this GNResource. In addition to food to prepare at home and demo classes, they have a limited selection of sandwiches & soups including a gumbo that Mr. pairs4life is always in the mood to consume. Last edited by pairs4life on March 15th, 2012, 2:21 pm, edited 1 time in total. I also fully suport this nomination, and I'm glad it was made during this GNR cycle while Rob and crew are still top of mind. Terrific nomination, solid yes to GNR. Butcher & Larder, count me a fan! I support this as well, and like the resonance of Rob and Allie being potential recipients for two different places over time, and the first nominees for both a GNR and a GNResource (?). It's a boon and blessing to have good people continue to share and grow their talents and expertise in our community writ large. And preferably branded onto a good steak (or bread). Rob & Co. never refuse my requests to chop open a fresh sheep's head or two and gently scoop out the brains, glistening with freshness and ready to be curried, fried, etc. That and the daily sandwiches are awesome. GNR. This is such a no-brainer. From the excellent service and meats to the incredible dinners, I can think of few places more deserving of a GNR. Habibi wrote: Rob & Co. never refuse my requests to chop open a fresh sheep's head or two and gently scoop out the brains, glistening with freshness and ready to be curried, fried, etc. Ursiform wrote: This is such a no-brainer. Seems like LTH consensus, with or without brains. Great addition to the Chicago food scene. As much as I miss Mado, B & L is a pretty good tradeoff. I am totally on-board with this one. If you hadn't I would've. thaiobsessed wrote: Seems like LTH consensus, with or without brains. Sigh. I walked right into that one, didn't I? Between my travel schedule and being a hermit over the winter, I haven't been out on my bike as much, which means I don't ride past B&L near often enough. I swung by today on my way back from Chinatown, and was reminded how much I like Rob and Chris, and am honored to have them as my butchers. B&L sells high-quality meat, but it's more than just the meat that keeps me coming back. Nowhere else in the area do I feel like I can have a personal relationship with a butcher. I am biased, as I was a regular at Mado, but the first timers next to me got the same personal treatment, cooking advice, etc. To me, B&L feels like my neighborhood butcher shop. I have a terrific pate sandwich on Saturday - and some other fine pates. A definite yes: and they have been open over a year. Butcher & Larder almost leaves me speechless. I just think it's that special, and yet I'm reluctant to go on the record expressing such satisfaction because I miss Mado more than any restaurant that's closed in Chicago in recent years. Some of the things I appreciate at B&L: great products, very friendly service, led by a chef who can offer cooking tips in a way most butchers cannot, and . . . prices that are reasonable. That's right, I've found lesser quality of seemingly the same items at Whole Foods that are priced higher than at B&L - most recently, beef tenderloin. On top of all that, I appreciate their focus on offering the whole animal and more unusual cuts, some of which are found in their delicious lunch specials. A GNR in every which way. dansch wrote: B&L sells high-quality meat, but it's more than just the meat that keeps me coming back. Nowhere else in the area do I feel like I can have a personal relationship with a butcher. I am biased, as I was a regular at Mado, but the first timers next to me got the same personal treatment, cooking advice, etc. This pretty much sums up my feelings as well. I'm lucky to live nearby, so I frequent the Butcher and Larder as often as I buy meat. I love discussing recipes with Rob, and know that he will always have a cut of meat in my price range to suit my planned meal. Over the years, I've gotten to know Rob, and he is a principled, intelligent and responsible small businessman, butcher and citizen. I am very grateful that Rob is nearby to source and butcher meat for me according to his exacting standards. I trust what he sells, because I trust him. Yet, it never ceases to amaze me that every time I'm there, someone walks in, is baffled by the personal service, the dialogue that goes on between butcher and customer, and walks out. 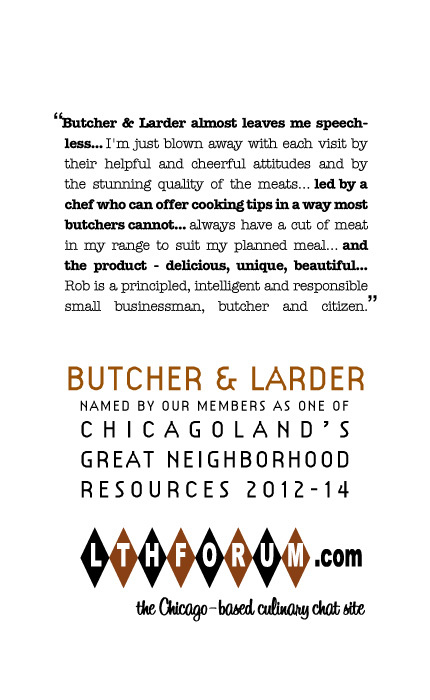 The Butcher and Larder is partly redefining and partly reintroducing to customers how to buy meat, interact with their food source, and ask questions if they have them. Rather than defaulting to pre-packaged ground beef because it's easy to prepare in a nonstick skillet, Rob patiently and gently educates his customers about the efficacy and benefit of eating "alternative" but equally delicious cuts of meat, and will take the time to talk to them about preparing these cuts. You could argue that Rob and Chris are Great Neighborhood Resources, but that would shortchange the beautiful product they sell. A definite yes to GNResource. I support B&L. Though I have a few minor quibbles, it represents the forefront in the modern butcher (and larder). I hope that over time, butchers like B&L become more common.